That, my friends, is a joint advertisement for Taylor Swift’s Reputation and UPS, which has partnered with the pop supernova for her upcoming fifth album. As part of the promotion, you can pre-order the record through UPS’ website, where you’re entered to win premium concert tickets, signed memorabilia, or merchandise from her store. 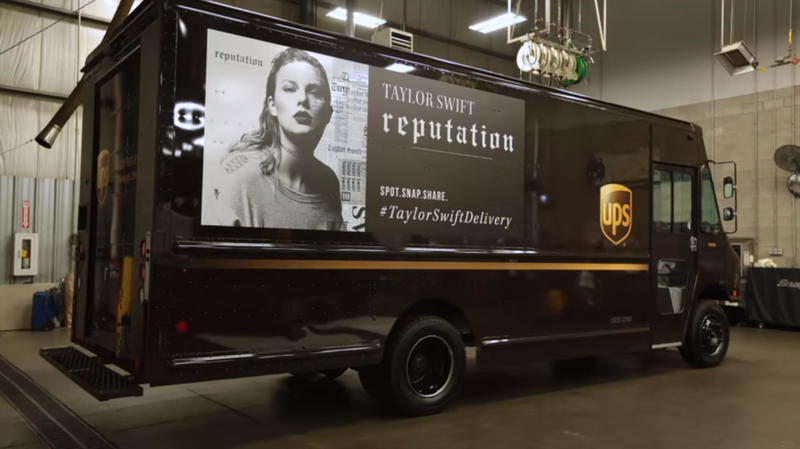 They’re also driving UPS trucks around the country with her album cover plastered on the side. It’s all very creepy. I saw the Taylor truck around my neighborhood a few weeks ago, with exactly none of this fanfare. Unlike the Chevy commercials which vow that everyone on camera are REAL PEOPLE, UPS doesn’t bother with any disclaimers that these aren’t paid actors reading from a bad script. Swifties are a passionate bunch, no doubt, but I’m not quite sure what makes this fleeting photo op with a UPS truck “very exciting and unexpected,” as one fan describes it. The commercial pans out with an overhead shot of everyone waving and high-fiving. Perhaps more enticing for the Taylor hive, is what could be a snippet of new music in the commercial. As Vanity Fair points out, one fan account slowed the background music down until a voice that vaguely sounds like Swift sings “rip off the page.” Someone in the TrackRecord Slack channel compared the backing track to something that might appear on Dance Dance Revolution.